One of the Soul Mafia originals will be back on the decks this June, when we welcome Jeff Young to the Summer Soulstice fold once again. As well as his club DJ exploits from back in the day, Jeff is also considered by many as one of the pioneers of the UK dance scene. His shows & the diverse club orientated music he played on Radio 1 & on London’s Capital Radio & Kiss FM stations in the 1980s & 90s, stand testament to that. 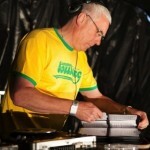 Also a music industry veteran of over three decades, this will be his 5th appearance at Soulstice. We welcome Youngy to this year’s heavyweight DJ line-up & you’ll be able to catch his set on the Summer Soulstice Main Stage!